What’s the most affordable way to update classroom furniture in school rooms? Start with our daycare chairs featuring contemporary and classical styles. Break boring institutional patterns with fresh contemporary designs. Tots and school-aged children love the scooped-out seats of the iconic Eames-style chair with open sides and a high back. So comfy! Our child-sized furniture comes in classic, day-brightening colors, too. This commercial chair model has the same mid-century modern style that makes it popular with adults for business settings — but it’s kid-sized. These traditional ladder back styles feature rounded edges and corners for safety, and come in solid wood birch. 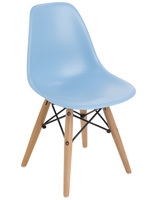 Choose molded resin seats or wooden ladder back desk chairs, or a couple of each. Our molded resin seats and wood seating are perfect for library reading circles and playroom activities. Why is Eames-style seating so appealing to teachers and commercial day care providers? Our daycare chairs come in classic white and black. They are also available in trendy French bleu to brighten up school- and play-room settings. The mid-century modern flair provides high-end styling at an affordable price. This classroom furniture says (in your inside voice): FUN! 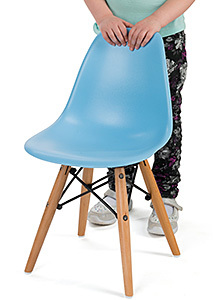 This plastic seating features wooden legs. Steel wire Eiffel-style connectors provide stability while providing architectural flair. The furniture is lightweight so kids can help teachers put them away at the end of a lesson. The legs are sturdy enough to prevent tip-over for toddlers who are of the recommended age to sit in them. 12”h Seating height supports toddlers, older tots, and school-aged children. The high back and open sides make it easy for the littles to get in and out. That means instructors won't have to waste time turning tipped-over chairs upright! 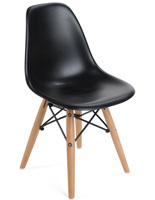 Our iconic Eames-style chairs marry trendy with classic lines. They are evocative of one of the top furniture brands of all time. 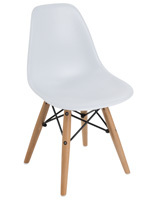 Charles and Ray Eames introduced the design after World War II, and it became wildly popular. Displays2go has replaced the fiberglass construction with molded resin seats for affordability without sacrificing stability. Preserved is the rounded styling that protects kids from harming themselves while playing. Teachers love how lightweight this molded plastic furniture is. Foster a spirit of cooperation in the classroom by enlisting kids' help in putting everything away at the end of class. Got a little more money to spend in your budget this year? Invest in a complete set of commercial daycare chairs and tables with wooden legs! What are some traditional options for child size classroom furniture? Jonti-Craft™ ladder back chairs are a great choice for lovers of "old school" tradition in the classroom. Reinvent the traditional schoolroom chairs of yesterday with this updated, modern reinvention! Seat height placements cover the gamut from 10”h, 12”h to 14”h to accommodate most children from little-littles to big-littles. Ladder back chairs have old school charm but they are practical, too. Gliders on the feet prevent floor scratches. Stain resistant solid Baltic birch wood keeps children safe and it looks modern and fresh in any setting. Eco-friendly GREENGUARD gold certified ensure toddler and kids are playing safely, which of course is the first priority. Ergonomically healthy straight back design of this chair promotes proper posture in small children - challenge tots and small ones to sit up nice and straight. Our ladder back desk chairs from Jonticraft complement other products from the line. Pair them with a wooden child's activity table with recessed book compartments by the same company. Designing your daycare setup for the front room of a classroom or designated playroom in your home is easy when you have the right furniture. Why not ask the kids for input? Let them help you choose a style from our wide selection of trendy and classic designs. Shop Displays2go for stackable daycare furniture and visitor chairs in resin or wood that stand the test of aesthetics and durability. Enjoy timely shipping and deep discounted prices for bulk ordered items.